Lady and Man were asleep. Man was snoring. Theodore was awake. A sound had woken Theodore. He’d heard voices and other sounds, and they had woken him. Theodore emerged from beneath the covers and jumped to the hardwood floor. The thump and claw clicks did not wake Lady andMan. Man had failed to shut the bedroom door. Theodore worked the door back with his nose and snuck through a thin opening. He shuffled across the hallway and into the guest bedroom. Theodore leaped into the seat and then the top of the chair near the window. 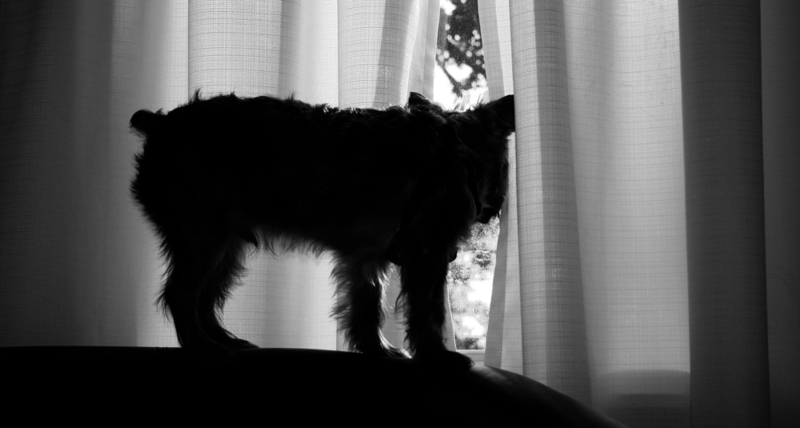 He peered through the linen curtains. The scene outside was dark and still. Theodore surveyed the yard, walkway, houses, street, trees, cars. Wait. Lady’s car was different. It was parked off the street, but that was normal. It faced away from the tree, but that was normal. White markings smeared the windshield, windows, sunroof and mirrors. This was not normal. Theodore growled. The white shapes and words were not usually on the car. Theodore continued to growl. Man and Lady still slept.